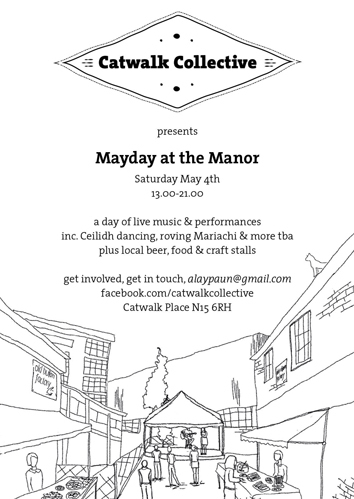 Catwalk Collective are holding a party to mark May Day, this Saturday 4th May, with live music (inc Mariachi), Ceilidh dancing, circus skills, and more, plus local beers & street food. See more in the flyer above - click to enlarge. 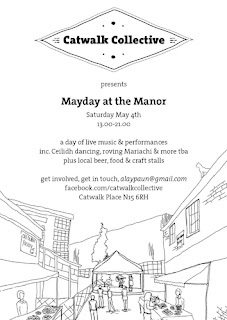 "Come join us for the pagan celebration of Mayday. A day for rebellious spirits, and creative souls to sing dance and be merry. The Catwalk Collective is proud to announce that the amazing Juliette Lee will be running the show next Saturday as compere, and bringing some of her finest performers with her.